Product categories of Non-woven Fabric Line, we are specialized manufacturers from China, Non-woven Fabric Line, Nonwoven Fabric Line suppliers/factory, wholesale high-quality products of PP Nonwoven Fabric Line R & D and manufacturing, we have the perfect after-sales service and technical support. Look forward to your cooperation! Non-woven Fabric lines produce non-woven fabric with polypropylene(PP) and adopt the technology of air drawing into webbing by negative pressure, making into PP spun bond non-woven fabric. These machines are less investment, compact layout, space-saving, simple production technology, easy operation, labor-saving, and good compatibility. The product is featured by the uniform cover, great intensity, good breathable feature, good feeling and so on. It has been widely used in medical and protective products, household and hotel accessories, beauty cares disposable product, agricultural cover, clothes package and architecture and so on. 1) The whole line is well-structured and easy to run. 3) The control elements are of well-known brands with high performance and reliable technology. 4) The whole line is controlled by PLC and operated with the touch-screen. 5) The allocation of the mainframe and auxiliary equipment can be specially designed and adjusted according to customers requirements. Yes, we are direct Manufacture Factory, and our factory has been developed and designed the spunbond nonwoven production line since 2000. 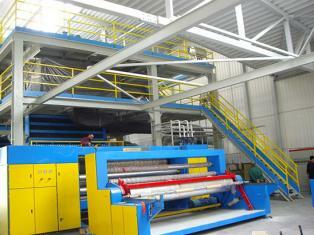 Q2: Do you have any other effective size of spunbond nonwoven machine? Yes, actually, our factory is able to make any effective size of spunbond nonwoven machine as your requirements. It is typical that our customers ask effective size to be 1600cm, 2400cm and 3200cm.